Detailing the physical features, habits, territorial reach and other identifying qualities of the Aphrodite Fritillary Butterfly. A garden filled with violets, milkweed and thistles will tempt an Aphrodite Fritillary in any stage of life while keeping future generations interested for years to come. Aphrodite is the Greek goddess of love, pleasure and beauty. The Aphrodite Fritillary is a lovely summertime butterfly that produces one brood each year. It has many close relatives that look very similar to it making identification somewhat of a challenge. To complicate things, males and females are different sizes, and hues vary in different regions of the continent. The yellow-green eyes of the Aphrodite Fritillary offer a fast way to eliminate almost all relatives. 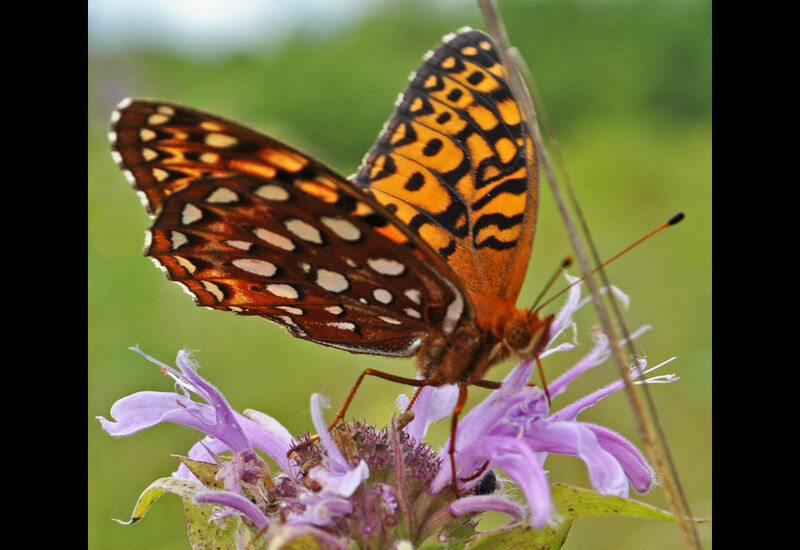 The Great Spangled Fritillary and Atlantis Fritillary share Aphrodite's range and also have yellow-green eyes, but they are much larger and smaller (respectively) than the medium-sized Aphrodite. Males Aphrodite Fritillary Butterflies are smaller than females, and may have a two week head start in life. They actively search for females during warm parts of the day. After mating, females can be seen walking on the ground near violets where they lay fertilized eggs at a rate of about one per plant. The caterpillar that hatches from these eggs eats the leaves off many types of violets in late summer. Its body is black and segments are studded with long rows of bristles from head to rear. These bristles may be black or yellow. It retreats in a shelter of leaves for the winter and emerges again in the spring when violets begin growing. They will pupate for two to three weeks in early summer. Adults are mostly orange with black markings on the tops of the wings. Light brown hairs cover the body and extend over the base of the wings. The underside of the wings is light brown with a lighter border at the bottom edge. It is covered with various sizes of white spots. They can be seen drinking nectar from a variety of wildflowers. Milkweed, dogbane, thistle, and Joe Pye weed are popular flowering plants that feed adults. Meadows, fields, woods, marshes, bogs, prairies and barren land are all home to the Aphrodite Fritillary. Various elevations also suit this species, so high ranges and mountains are also comfortable habitats for this butterfly.